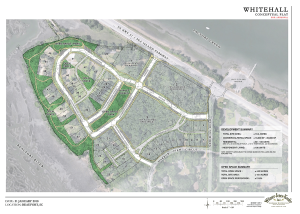 In a 6-0 vote before a packed City Council chamber last night, the Metropolitan Planning Commission approved a new plan to develop the Whitehall property on Lady’s Island. The slimmed-down plan calls for 80-100 residential units, a 100-unit independent living facility, and some 20,000 s.f. of commercial/retails space along the Sea Island Parkway. An earlier proposal, with more than 240 residential units in seven large apartment towers, was denied by the MPC in November. Last night’s approval of the “conceptual plat” was essentially the approval of building lots and the road network inside the Whitehall property. With this in hand, the developer is able to move forward with survey and engineering work to finalize lot locations and dimensions, water and sewer connections, and storm water management among other things. a contractural agreement with a certified arborist to ensure tree health and preservation “before, during and after” construction. Bill Harris, MPC vice-chair and member from the City, added two other conditions. 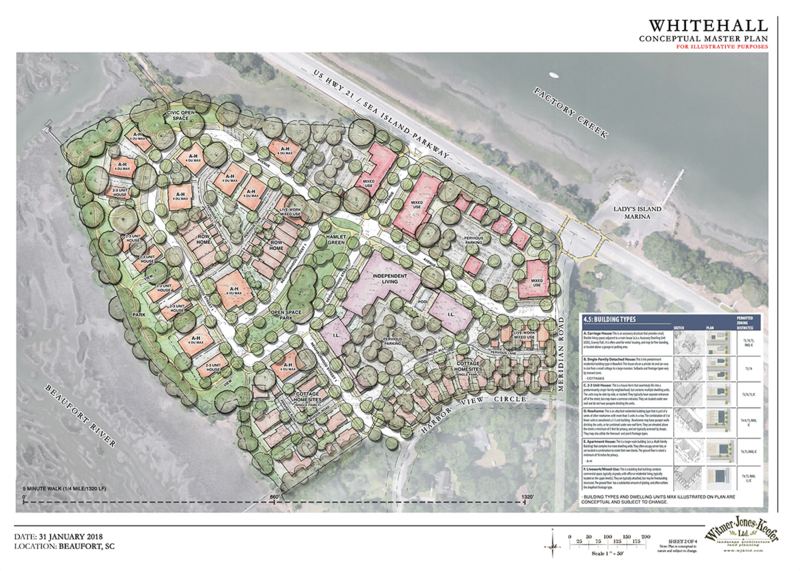 One directed the developer to shift one of the proposed lots to ensure a clear sightline to the river through open space at the center of the development. A second condition, added to “give some weight” to the issue, asked City planners to review the mass of the planned independent living facility during the design phase. The Sea Island Coalition argued that this facility was “out of scale” with the rest of the development and was contrary to requirements of The Beaufort Code. Mary Somerville, a director of the Coalition, said the group was pleased with the outcome. “If Whitehall is to be developed, this plan was a reasonable effort to do so in a smart way, as the Coalition had advocated. “By and large, this plan fits the character of the community, the scale proposed does not overwhelm the property, and the protections added by the MPC give us some confidence it will be developed the right way. “This plan doesn’t begin to deal with the horrific traffic problems that will result, and we now have to rely on processes at the City on subsequent design and density issues, with the mass of the independent living facility a key matter of concern. “But we are pleased the Coalition was able to make a positive impact on Whitehall, and we expect to continue to be involved in subsequent decision-making processes regarding the property. “Most importantly, this process highlighted the impact of community engagement. Without the hundreds of people who turned out for meetings and hearings all along the way, we are convinced the result would have been far, far worse,” Somerville said.